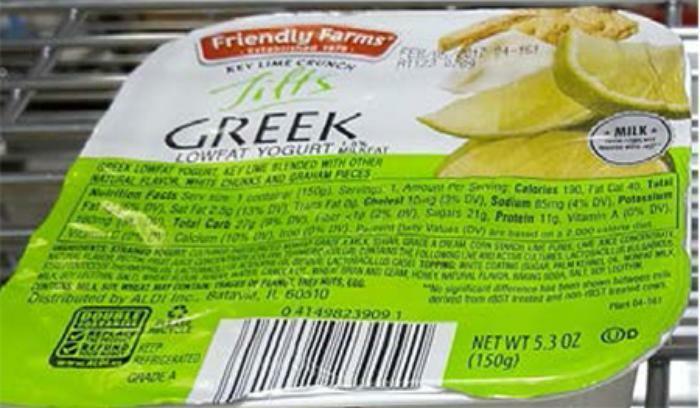 Commonwealth Dairy is recalling Friendly Farms Key Lime Crunch Tilts. The product may contain almond, an allergen not declared on the label. The recalled product includes two compartments -- one containing 1.5% Milkfat Key Lime Greek Yogurt and the other containing white chunks and graham pieces -- and comes in a green and white 5.3-oz, plastic cup. The UPC for the recalled product, sold in Aldi stores in Iowa, Minnesota, Wisconsin, South Dakota, Illinois, Ohio, New York, Pennsylvania and California, is 041498239091.